Can you imagine a workspace without a proper computer desk? We neither! It is rarely important to have this piece of furniture in your house. Why? Because it improves the efficiency of your work and creates appropriate conditions for prolonged sitting in front of a personal computer or a laptop. Nowadays, you can find various models of such desk. Actually, every person today can find a suitable configuration of a stand for oneself! When you are trying to choose the right desk, your decision must be based on a certain list of measurements. For the beginning, you need to choose an accurate location for your workspace. It unbelievably shortens the range of possible choices. Then, you should pick the design for your desk. For example, a small computer stand fits almost everywhere and looks great in apartments with the lack of space. On the other hand, a massive and solid U-shaped desk can be a perfect solution for multifunctional use: one part of it will be devoted to a computer while the other keeps your papers and stationery. 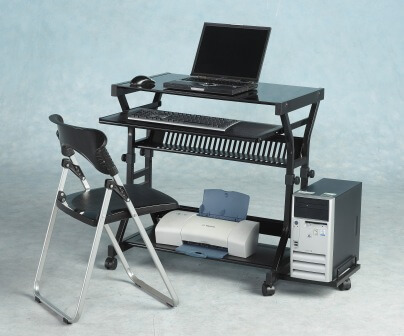 The size of your desk is also a matter of functionality, so be careful while choosing. As well, do not forget to check if the chosen desk is comfortable for your sitting. Cherry. Cherry is close-grained hardwood that resists warping and shrinking well. It is widely used in cabinet making, boat trim, and solid furniture handles because of its well-aging characteristics. Walnut. If you search for elegant yet strong material for veneered furniture, cabinets, wall paneling and decorative novelty trinkets – walnut makes a perfect match. Its deep dark color makes it even more sophisticated and attractive for you interior. Steel. This material made some previously unimaginable furniture and support systems possible and rather cheap. Its aesthetic and functional potential is nearly limitless. Plastic. Existing in any shape and form, plastic is a marvelous material for modern demands in the furniture industry.